This is our editing/stem mixing/”leave me alone” room. In true Unreal spirit, it is packed full of treatment to combat the small dimensions, and the monitoring system is comprised of a pair of Spiral Groove Studio Ones, a bryston 3B-ST amp and a hardware Coneq correction system to flatten the response. It is surprisingly accurate but the sweetspot is quite small. It also looks nice, cause it wasn’t designed by us. Since it is connected to our local network, the computer can stream data from our main recording drives. 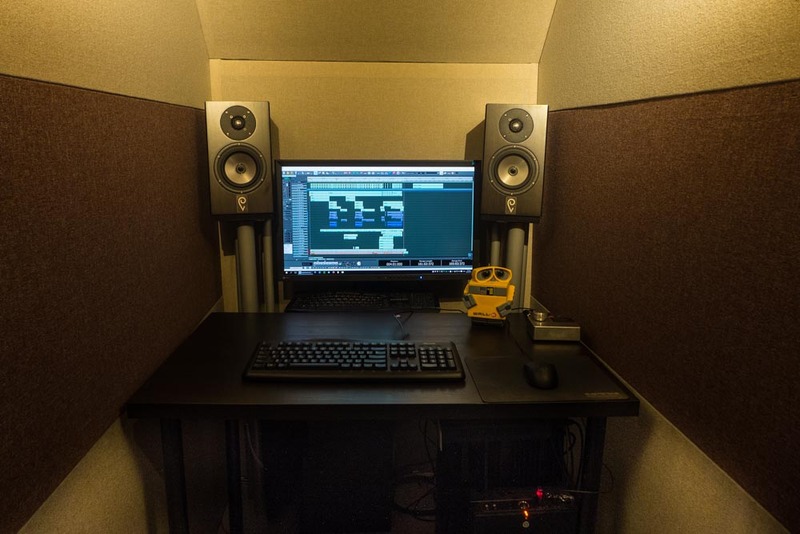 The functional upside to all of this is that you could be recording track no2 in the control/live room and have track no1 be edited in the cave, all in the same daw/project/hard drive. The pc is totally silent and the screen is a 4k Eizo to combat eye fatigue from long editing sessions.